In the 15 years to date seldom have we experienced such continuous fine weather in the build up to the show, so here is a brief look at the event from its set-up to its break-down over 7 days in mid-July. The Castle grounds look magnificent as ever, if perhaps a little scorched by 6 weeks of relentless sun, it is early on Monday morning and the first team of volunteers led by the show site manager arrive with plans, spreadsheets and tools to hand. They have prioritised their site layout programme to ensure the marquee supplier has full instruction upon where to locate the 15 marquees which will be scattered across some 36 acres of showfields, they have only one day to accomplish this massive task. The second day sees the start of marquees being erected and the detailed marking-out of the showfield which will host some 42 car clubs and 116 commercial and charity stands, by the end of the fourth day all has been accomplished and the site is ready for early arrivals. Over the next two days, Friday and Saturday there is an ever increasing number of stands being erected and vehicles delivered from museums and private owners, the catering village and children’s amusement areas are completed. By early evening on Saturday we are fully prepared for the greatest task of all, that of getting some 1500 cars into their correct position over the whole site by 9am. It is 6.30am on Sunday 15th July, Show day, and some 63 Rotarian volunteers check in at the information tent, bright yellow tabards are handed out and there is a palpable air of excitement and anticipation. Marshalls are despatched to their posts all over the site and 14 Rescue 4×4’s leave to patrol local roads, by 7am throaty exhausts hail the first trickle of cars to come through the main Castle gates eager to reach their designated parking areas. Each vehicle displays a colour coded windscreen hanger which denotes a specific showfield, stand number or site location. It is like a military exercise and within 2 hours the majority of cars are in place, over the first few public hours of the show they will be joined by another 500+ ‘On-the-Day’ classic and sportscars all parked in a dedicated area for public viewing. Officially open to the public from 9.30am many people arrive early to enjoy exploring all the exhibits before the heat of the day becomes exhausting. At 10am the Jazz band are playing in the catering village and at 10.30am the first Tour organised by Wessex Ferrari Club arrive right on time, as they line up by the lake they are joined by more Ferraris from a private collector and by Lamborghinis driven by members of the Owners Club. The PA, already running, crackles into action with a finish line commentary detailing each car as it arrives, after a brief chat with each driver they park up in their allocated areas and as the crowd lining the Castle drive disperse we hear an F1 Benetton burst into life along with other modern and historic race cars including the 27litre Meteor Special. The day features a celebration 70yrs of Land Rover and in the main display marquee sits the 1953 Royal Ceremonial Land Rover used by her Majesty the Queen and Prince Philip during the 50’s and 60’s, together with one of the early prototype vehicles. At 11.30am there is a parade of vehicles from 1948 to 2018 paying homage to the marque in its many forms and guises with a commentary from Land Rover enthusiast Richard Beddall of the Dunsfold Land Rover collection. Our regular supporters PistonHeads arrive with their tour at 12.30, some 40 supercars and exceptional vehicles noisily arrive at the finish line to be greeted and after a brief chat moved into their reserved parking area. A throng of visitors now head to the auction area where sales begin at 1pm others enjoy picnics in the beautiful grounds of the castle; the catering village large circular marquee provides welcome shade for some and a steel band takes over the entertainment. For some the Members marquee is the choice for the day and they enjoy a fine meal in elegant surroundings on the Castle East Lawn where 100 American cars are on display. Then at 2pm the air fills with the sound of Rally cars being prepared for their parade, this to be led by our famous celebrity guest for the day, Paddy Hopkirk, driving a mini cooper ‘S’ to full rally specification. Paddy has been signing autographs and chatting with the public in the rally marquee alongside the mini in which he won the 1964 Monte Carlo rally, straight after the parade he is filmed giving a very amusing interview recounting stories from his past and current activities. 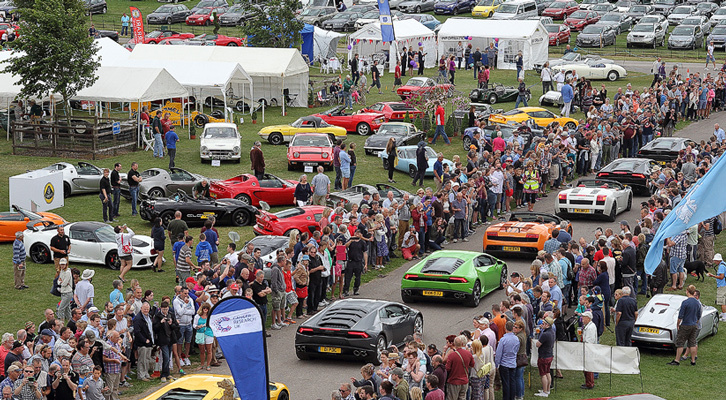 Then at 3pm the last parade features 30 supercars, including- McLaren, Lamborghini, Ferrari, Aston Martin, Noble, Ultima, Porsche, Shelby Mustang and a host of other very high powered cars which roar into life and complete a circuit through the castle grounds. These having been chosen as a representative selection from over 130 present on the day. Finally at 3.30pm cheques are awarded for category winning car clubs, these presented by our main sponsor Lancaster Insurance. 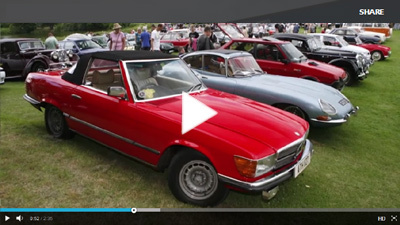 The day has seen some 2000+ cars on display, there have been around 12,000 people at the show and to top everything the organisers expect to donate around £45,000 to local charities. We give a huge thank-you to the Rotary volunteers, all the exhibitors including private individuals and traders, those who support us as sponsors or in kind and of course the visitors who make this possible. Each year preparation for the next show begins as the dust, and it really did this year, settles at the end of the current event and so the planning for another great show on 21st July 2019 is already underway. To be part of it follow our website http://www.classic-supercars.co.uk.